The findings, in mice and people, are published May 14 in Science Translational Medicine. They support preliminary mouse studies that evaluated a variety of antidepressants. 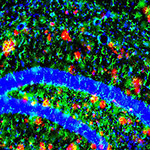 Amyloid plaques (shown in red) dot the brain of a mouse model of Alzheimer’s disease. Scientists have found that an antidepressant can reduce production of the primary component in these plaques. Brain plaques are tied closely to memory problems and other cognitive impairments caused by Alzheimer’s disease. Stopping plaque buildup may halt the disastrous mental decline caused by the disorder. The scientists found that the antidepressant citalopram stopped the growth of plaques in a mouse model of Alzheimer’s disease. And in young adults who were cognitively healthy, a single dose of the antidepressant lowered by 37 percent the production of amyloid beta, the primary ingredient in plaques. Although the findings are encouraging, the scientists caution that it would be premature for people to take antidepressants solely to slow the development of Alzheimer’s disease. Amyloid beta is a protein produced by normal brain activity. Levels of this protein rise in the brains of patients with Alzheimer’s, causing it to clump together into plaques. Plaques also are sometimes present in cognitively normal brains. Cirrito’s earlier research had shown that serotonin, a chemical messenger in the brain, reduces amyloid beta production. First author Yvette Sheline, MD, also has linked treatment with antidepressants to reduced plaque levels in cognitively healthy individuals. Most antidepressants keep serotonin circulating in the brain, so this led Cirrito and Sheline to wonder whether the drugs block the increase of amyloid beta levels and slow the progression of Alzheimer’s. In 2011, the researchers tested several antidepressants in young mice genetically altered to develop Alzheimer’s disease as they aged. In these mice, which had not yet developed brain plaques, antidepressants reduced amyloid beta production by an average of 25 percent after 24 hours. For the new study, the team gave citalopram to older mice with brain plaques. Jin-Moo Lee, MD, PhD, professor of neurology, used a technique called two-photon imaging to track the growth of Alzheimer’s-like plaques in the mice for 28 days. Giving the mice the antidepressant stopped the growth of existing plaques and reduced the formation of new plaques by 78 percent. In a second experiment, the scientists gave a single dose of citalopram to 23 people ages 18 to 50 who were not cognitively impaired or depressed. Samples of spinal fluid taken from the participants over the next 24 hours showed a 37 percent drop in amyloid beta production. Now the researchers are trying to learn the molecular details of how serotonin affects amyloid beta production in mouse models. This study was funded by the National Institutes of Health (NIH) grants R21 AG03969002 (Y.I.S. ), R01 AG04150202 (Y.I.S. ), NIH R01 AG042513 (J.R.C. ), R21 NS082529 (J.-M.L.) and R01 NS067905 (J.-M.L. ); Washington University Hope Center for Neurological Diseases (Y.I.S. and J.-M.L. ); and Washington University Biomedical Mass Spectrometry Resource (P41 GM103422, P60 DK020579, and P30 DK056341). Sheline YI, West T, Yarasheski K, Swarm R, Jasielec MS, Fisher JR, Ficker WD, Yan P, Xiong C, Frederiksen C, Grzelak MV, Chott R, Bateman RJ, Morris JC, Mintun MA, Lee J-M, Cirrito JR. An antidepressant decreases CSF Ab production in healthy individuals and in transgenic AD mice. Science Translational Medicine, online May 14, 2014.